Looks like this gentleman's wife is about to get a bouquet of mimosa. 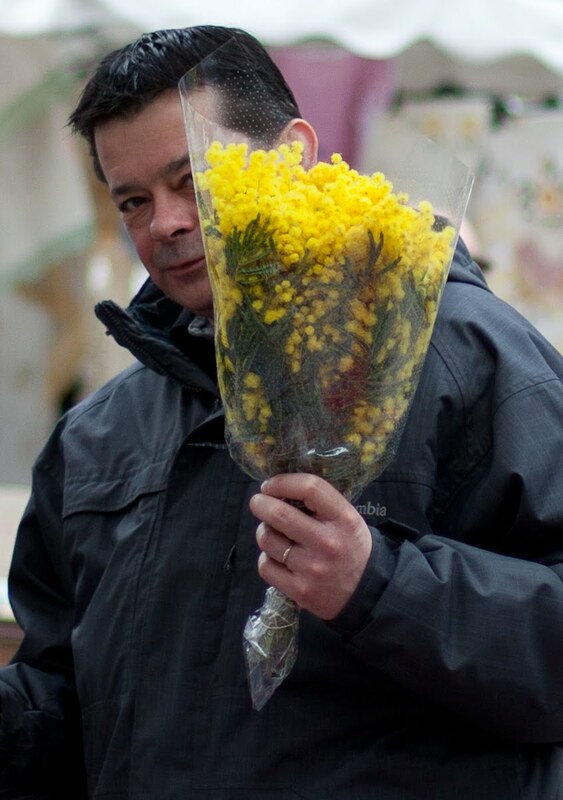 On dirait que l'épouse de ce monsieur va recevoir un bouquet de mimosa. I am trying to ignore all that boy stuff. Shows how much I know - I just drink Mimosas! I'd appreciate a bouquet of flowers anytime, regardless of the motivation! Took a photo of a mimosa seller today. Mimosa always makes me think of France. When can we expect the rest of 'Promenade de Corbusier'. Thomas, yes! You are absolutely right. Well, the good weather is here now and one day I'll do that walk - probably have to do it twice to get the light right. Remember there is not nearly so much to see from the Cabanon on to Monaco, but there is some. Thanks for the reminder. Don't promise when I'll do it but I will! In addition, the Grey villa is now open to the public - it's been restored, so it would be nice to include that. I love it, Jilly, when readers have long memories. Hmmm I'm with Cathy...I drink Mimosa's...didn't know they were flowers too!!! Lucky lady!! !